Sekiro: Shadows Die Twice Story Trailer Shows Sekiro’s Origin | Nerd Much? With Sekiro: Shadows Die Twice nearing its March release date, Activision is ready to start the promotional push to ensure we know it’s on the way. And with that promotional push comes today’s Sekiro: Shadows Die Twice story trailer. Activision and FromSoftware describe today’s footage as a story preview. And with the clip barely being a minute in length, there’s not much story to be found. The Sekiro: Shadows Die Twice story trailer thrusts us into the middle of a samurai battle field doused with bodies and blood. 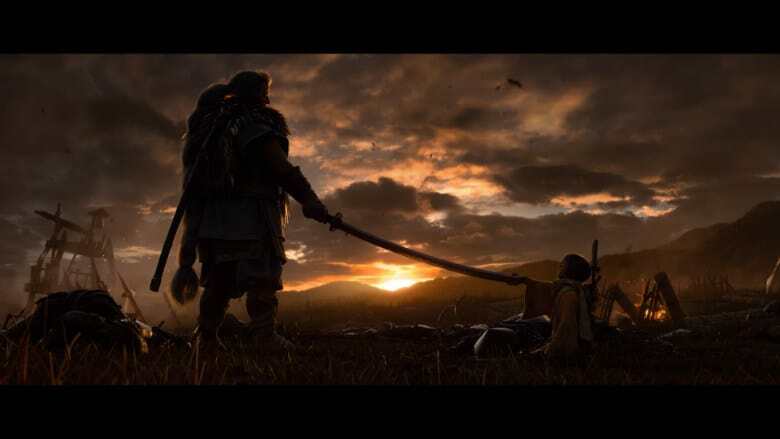 Once the dust settles, a lone samurai finds a young Sekiro kneeing on the ground with sword in hand. The samurai puts his blade to Sekiro’s left cheek and gently slides it up, causing blood to trickle down Sekiro’s face. “What’s the matter, stray? Nothing left to lose?” the samurai asks. Sekiro then looks up at the large man, and grabs the end of his blade with his right hand. “Well would you look at that” the samurai remarks. “Will you join me, starving wolf?” And thus, seemingly, Sekiro becomes the man’s apprentice. Sekiro then looks up at his master with an ominous look. Is he about to turn on the man that helped to decimate the family of his youth? Or is Sekiro ready to continue on his mission that Activision describes as “Take Revenge. Restore Your Honor. Kill Ingeniously.” I suppose we only have a month and a half until we find out. FromSoftware, creators of Bloodborne and the Dark Souls series, releases Sekiro: Shadows Die Twice for PC, PlayStation 4 and Xbox One on March 22nd.